As someone who has first hand experience with raising a pig through the pig's adult life I know how smart and sensitive pigs can be. One cold night I found a small beagle size pig along the road, injured with deep cuts across her back. Her eyelid was almost torn off. 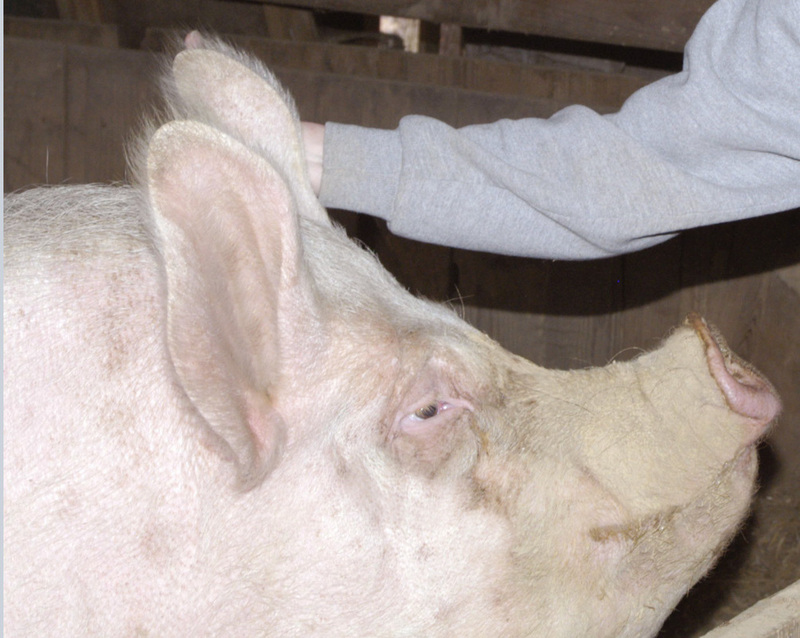 Sparkle, as she was named, recovered and grew to a full size Yorkshire sow, weighing eventually about 900 pounds, according to her veterinarian. She was not obese she was big due to the fact she had lived so long. Two farmers told me she was the biggest pig they had ever seen. My dear friend Rosella always said Sparkle was a "fine pig." Sparkle enjoyed going to the creek, playing in her wading pool and lounging in the pond. Never wanting to be left behind she would run along behind us, dogs and cats as we walked through the field and if I sat down, when she was still small enough, she would lay across my lap. She loved fruit, vegetables and cooked oatmeal fed to her with a big spoon. Grapes and raisins were favorites, she would almost knock a person down to have some. With her giant mouth she would very delicately take one single raisin out of the palm of my hand, never missing the mark or nipping me. At the age of eight years we had to have her put to sleep after what the vet suspected was a back injury. Not being able to move normally and lying down constantly led to a foot abscess which we cured. However another developed and, although it also was cured, eventually she could no longer get up. I consulted with two veterinarians at Kansas State and Purdue. Neither could offer any hope. They both said feet and legs give out first on a sow and once they get down getting them up is almost impossible. The Purdue float tank is only designed for horses, cattle, etc. Not for pigs. As spring approached although she was spry and always eager for a can of peaches she still couldn't walk and other problems developed which couldn't be fixed. The painful decision was made to let her go. It took canceling three vet farm calls before I could get the strength to end her life. She was remarkable. I was honored to have cared for her. Someone committing acts of cruelty, violence and disrespect, shown in the photos on the right, against Sparkle is beyond imagination. No animal should be treated this way. When watching the videos you can hear them screaming in panic and gasping for air. Their heads are pushed under the muck and in one video the pig spews out the slimy fluid. If this were a cat or dog we would be sickened. No less feeling should be granted these defenseless animals. Please sign our petition join us Wednesday evening at 7pm with the Harrison County Fair Board as we ask that they say no to the Pig Wrestling event being considered at the 2015 Fair. Please let us know if you plan on attending. "The pigs have health records, a Fair Board rep said, and they'll be walking through disinfectant before getting in the ring. There will be a veterinarian on site, just in case." Are you kidding me? A paid veterinarian on site to do what? X-rays, surgery. It isn't possible. And walking thru disinfectant? What about the feces and urine in the mud. The only way they can stop that is to not allow the pigs food and water for days ahead of the event. So the exciting attraction will actually be starved, dehydrated, terrorized pigs being brutalized by humans. What a proud achievement for America. I grew up on a farm in Harrison County, Indiana. My Dad had a Dairy farm, but along the way we also raised chickens and pigs at some point. As a farm kid my job was taking care of the baby animals, mostly bottle feeding the baby calves. But I did help with the pigs and chickens some too. My Dad, who was a life-long farmer taught all of us kids to care for the animals because they had value. Obviously, they had monetary value, but it was more than that. We were taught to nurture the animals - to respect their place in our lives. Was life ideal for farm animals? No, I'm sure it wasn't. But when they got sick we sat up on a bale of hay propped against the cows so they wouldn't lie down and bloat. When a baby calf had scours in the winter, into the basement it would go so it could stay warm. We kept the baby pigs in a wood farrowing crate with the Mom so they could get away, with a heat lamp over the area where the little piglets could stay warm and safe. Every spring we went to Eaton's hatchery and got baby chicks then brought them back to the brooder - then watch the little chicks and make sure they ate and drank properly so they could get strong and be put out in the chicken house. All this is to say that family farmers depend on the well-being of their animals to be successful. The extra care that we put into raising them came from generations of farmers who learned to give them care so they would not just survive, but thrive. It makes no sense for a farmer to mistreat or abuse an animal in any way. And any farmer worth his salt wouldn't do it anyway - it goes against every instinct, every life lesson a good farmer learned from the time they were knee high to a grasshopper. These family ideals were reinforced by the 4-H, which taught us to be kind and caring - to use our heart in dealing with all living things. 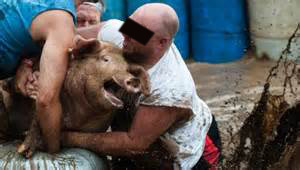 How sad - how wrong it is to go against everything we ever learned about farm animals for an afternoon of the insanity of so-called pig wrestling. An event vile and disgusting in every way - terrorizing a pig, overpowering it and body slamming it on or in a barrel. The pigs end up face down in the muddy water, where the inhale the mud an yuck in their sinuses and windpipe. Headline - the Harrison County Fair water-boards young defenseless pigs. No one who has ever given a bottle to a little calf that was just taken from its mother, put a fluffy baby chick in the brooder to make sure it stayed warm, or "grunted" to a pig to get them to talk back to you could possibly disregard their emotional and physical well-being in this way. Farm animals are raised to ultimately be slaughtered and we all know that, but humans who have the animals up to that point have the obligation and the honor to treat them with kindness and human decency. If the Harrison County Fair Board can't see that, then I don't think you have any business being responsible for the Fair, or anything else that can affect the lives of innocent animals or the psychological well-being of children that might be traumatized by the pigs being abused. Or for the children who misconstrue the sanctioned abuse of animals to mean the violence against living beings is OK, including against other humans. How many times have the police told us children that abuse animals grow up to abuse people or to be serial killers? Your decision will define not just the Fair, but Harrison County and Corydon. As far as I know the Fair has never had an event in which animals are abused and traumatized. I just don't understand why we are dealing with something this barbaric in 2015. ->So God made a farmer - but not to scare and abuse innocent animals. Dropped on her head into the mud this pig could have suffered neck and spine injuries and inhaled the muck into her lungs. Considered no more than trash she is tormented to the point of exhaustion then thrown in a trash can. She is probably in pain and suffers scrapes and cuts as her weight pulls her down against the edges of the metal container. See her back swaying down. The video to this particular scene is gruesome. Look at them pulling her front legs, exactly what is never to be done to a pig. in the name of fun and entertainment.